This famous principle also applies to science talks. That dense wall of bullet points? Most of the audience won't read it. Those that do will immediately forget it. When you're giving a 20 minute talk amid a week-long conference, always remember that your well-intentioned colleagues will be tired, distracted, and uninterested by default. There's a good chance that half of the audience will be staring at their laptops for at least half of your talk (look around the room next time you're at a conference - you know I'm right). I'm convinced that, If you're lucky, the audience will remember one thing from your talk. Pick that one thing you want the audience to remember, and then assign it minimal cognitive load. Slices through a MUSE datacube showing Hα+[N II] velocity structure in the famous collisional ring galaxy ESO 350-40 (the "Cartwheel"). The three bright shimmers you see are, in order, the [N II] λ6549 Å, Hα λ6563 Å, and the [N II] λ6585 Å emission lines, clearly revealing ~220 km/s rotation of the galaxy. Of course, there's loads of quantitative information lacking here (although I did show physical scale bars in kiloparsecs). But I think there are certainly times when a pretty, eye-catching movie comes in handy. A science talk before a tired audience is one of them. HST+Chandra composite of ESO 137-001, a late-type galaxy that is falling into the Abell 3627 galaxy cluster. The intracluster medium (ICM) acts as a wind on the interstellar medium (ISM) of the galaxy, and draws it outward via ram pressure stripping. The H-alpha and X-ray tail left behind is ~80 kpc long (!!). Hα+[N II] velocity structure in the MUSE cube of ESO 137. As its ISM is stripped out of the galaxy, it retains its angular momentum, leaving behind a spinning corkscrew of warm gas in its wake. The transformational field of view of MUSE enabled covering the entire stripped tail in only two pointings. I wrote an incredibly simple piece of code to make these movies, which you can find here. The code is specifically tailored to MUSE and ALMA datacubes, but it can trivially be altered to work for effectively any three-dimensional datacube. Anyway, here's a sample gallery of various sources, most of which are cool core Brightest Cluster Galaxies. Most are pretty famous, so see if you can identify each source (mouse over each movie to find the answer). M87, BCG of the Virgo cluster. Centaurus A. This source is very nearby, and is therefore huge on the sky. This single MUSE pointing is aimed at the galaxy's edge-on dust disk in the nucleus. The rotation of the galaxy is nevertheless very clear. Abell 1795, another canonical cool core BCG. Check out Helen Russell's awesome ALMA paper on this source. HE2211-3903, a CARS galaxy (okay, I didn't expect you to get this one). 2A 0335+096, a cool core BCG. 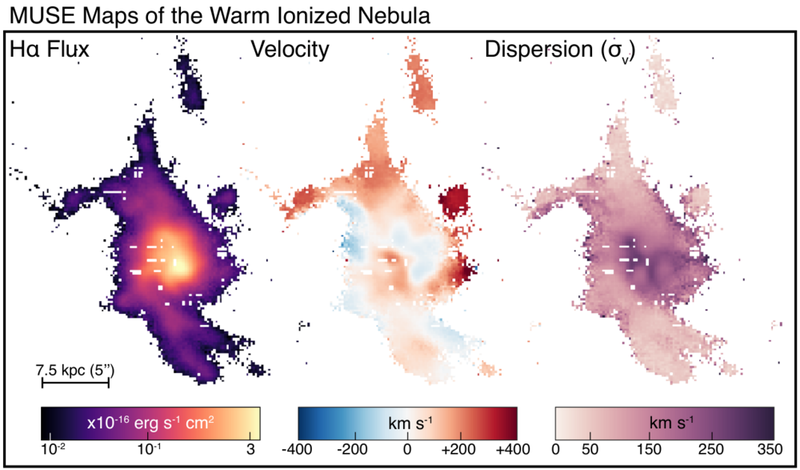 Check out Adrian Vantyghem's nice ALMA paper on this awesome source. NGC 5044, a nearby group with a cool core. Check out Larry David's famous ALMA paper on this source.